A 24 year old male presents with 36 hours of right testicular pain. He is a poor historian and can’t provide details for the onset, although he has risk factors for sexually transmitted infection. His right testis is swollen and tender. The clinical question is torsion vs epididymo-orchitis. 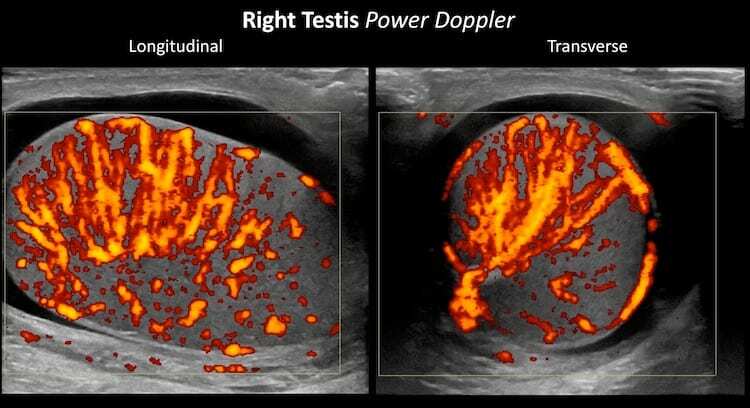 Image 1: Transverse view sweeping from superior to inferior through the right testis; Power Doppler. PARA Marked hypervascularity is evident. Views like this coined the term scrotal “inferno“. 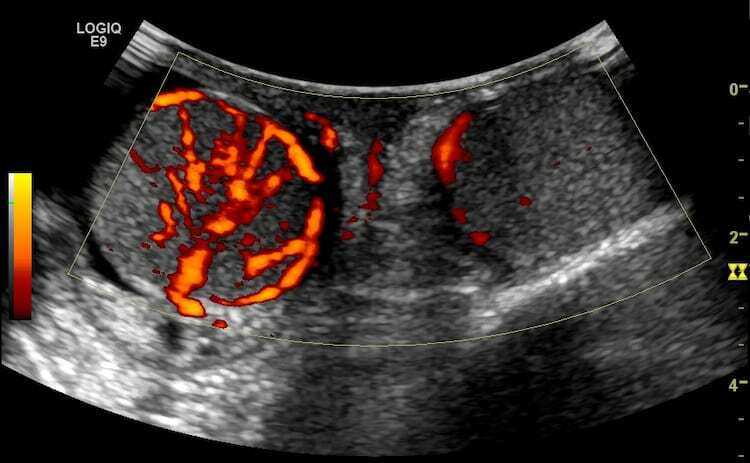 Image 2: Longitudinal view sweeping across the testis. Again increased vascular flow is evident. An enlarged and rounded right testis. 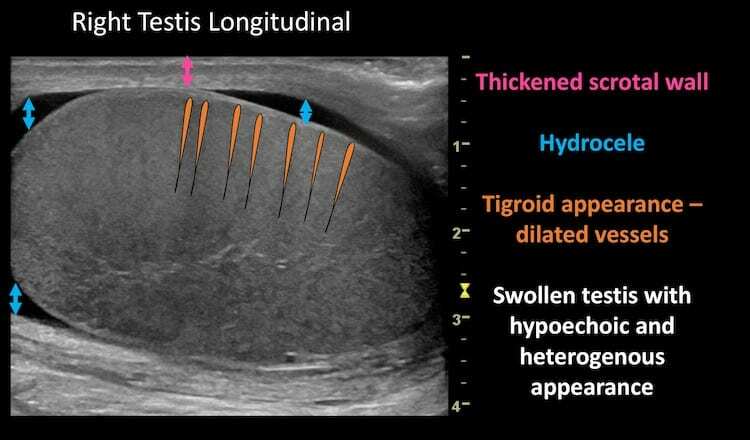 Testicular echotexture is relatively hypoechoic and heterogenous on the right, with a subtle tigroid appearance caused by dilated testicular vasculature. Image 4: Still longitudinal power Doppler images documenting the inferno of orchitis. 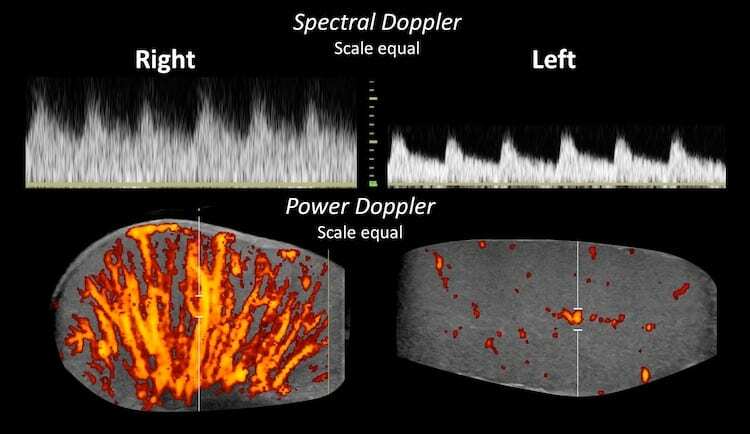 Image 5: Direct comparison of spectral Doppler examination of both testes with scales set identically. Both testes show a low resistance pattern of flow. Flow in the right testis has higher systolic and higher diastolic velocities than the normal left side. 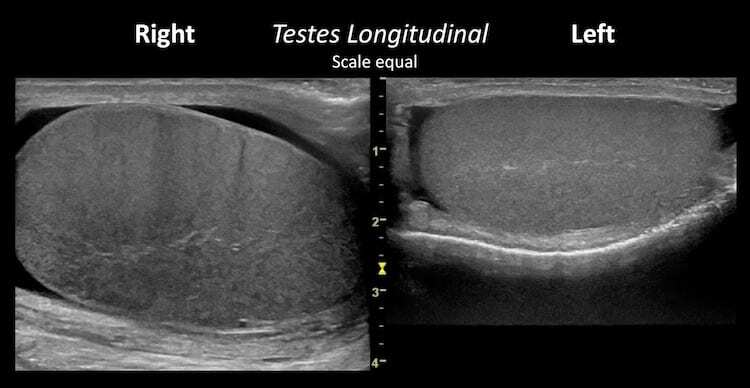 Calculation of the resistive index on the right (RI = (peak systolic velocity – end diastolic velocity)/peak systolic velocity) shows even lower resistance in the right testis which is not surprising – there is extreme vasodilation. RI Right = 0.40; RI Left = 0.58. Image 6: The “spectacle” or “sunglasses” view – both testes are seen in transverse section in a single image – for comparison. The scrotal swelling meant this was best achieved with the curvilinear transducer, however resolution is poor. Never the less, the changes of hypervascularity in the right testis are again evident. Orchitis in this age group, with these risk factors is usually associated with epididymititis and termed epididymo-orchitis. This case had a slightly hyperaemic and inflamed right epididymis, but the testicular changes were more marked. Ultrasound should not delay urological opinion and if required operative intervention in suspected testicular torsion. The presence of testicular flow does not exclude torsion. It is not uncommon for some flow to remain despite ongoing torsion. Torsion – detorsion can occur and hypervascularity of the testis may be present reflecting a reperfusion hyperaemia. In severe orchitis testicular infarction may occur. These may be focal (often wedge-shaped) or generalised. 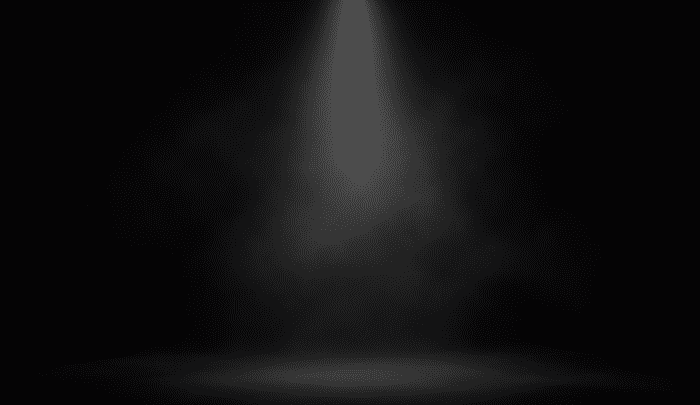 Where not immediately evident, the diagnosis is made by carefully correlating the history, the examination and and sonographic findings and maintaining a high index of suspicion. 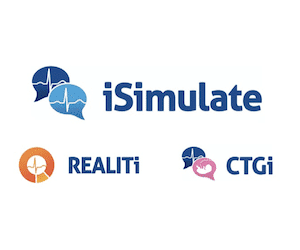 The experience of the operator as well as the quality of the ultrasound machine and subsequent gray-scale and Doppler images makes a big difference in the acquisition and the interpretation of the images.